by Chris Woodford. Last updated: April 6, 2018. There's no such thing as alchemy—magically changing common chemical elements into rare and valuable ones—but electroplating is possibly the next best thing. The idea is to use electricity to coat a relatively mundane metal, such as copper, with a thin layer of another, more precious metal, such as gold or silver. Electroplating has lots of other uses, besides making cheap metals look expensive. We can use it to make things rust-resistant, for example, to produce a variety of useful alloys like brass and bronze, and even to make plastic look like metal. How does this amazing process work? Let's take a closer look! Photo: Electroplating in action—an exhibit at Think Tank (the science museum in Birmingham, England). 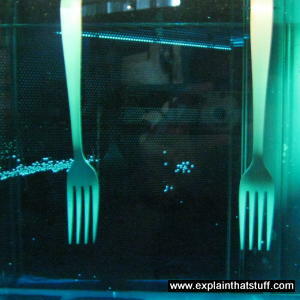 These two forks are the electrodes and the blue solution (copper sulfate) is being used to copper-plate one of them. 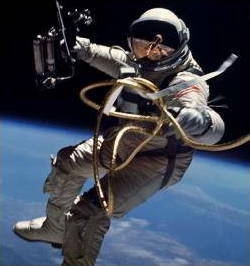 Photo: Gold-plated: When astronaut Ed White made the first American spacewalk in 1965, he was wearing a gold-plated visor on his helmet to protect his eyes from solar radiation. Photo by courtesy of NASA on the Commons. 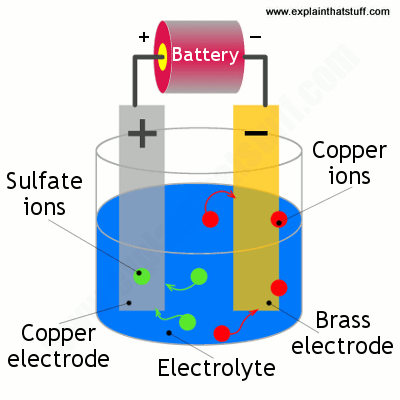 Electroplating involves passing an electric current through a solution called an electrolyte. This is done by dipping two terminals called electrodes into the electrolyte and connecting them into a circuit with a battery or other power supply. The electrodes and electrolyte are made from carefully chosen elements or compounds. When the electricity flows through the circuit they make, the electrolyte splits up and some of the metal atoms it contains are deposited in a thin layer on top of one of the electrodes—it becomes electroplated. All kinds of metals can be plated in this way, including gold, silver, tin, zinc, copper, cadmium, chromium, nickel, platinum, and lead. Electroplating is very similar to electrolysis (using electricity to split up a chemical solution), which is the reverse of the process by which batteries produce electric currents. All these things are examples of electrochemistry: chemical reactions caused by or producing electricity that give scientifically or industrially useful end-products. Photo: Silver cutlery is expensive and tarnishes; stainless steel plated with chromium is a good substitute for many people. Although it's rustproof and durable, the plating does eventually wear off, as you can see in the brownish area in the center of this pie server. "EPNS" marked on cutlery is a definitive sign of plating: it stands for electroplated nickel silver. First, you have to choose the right electrodes and electrolyte by figuring out the chemical reaction or reactions you want to happen when the electric current is switched on. The metal atoms that plate your object come from out of the electrolyte, so if you want to copper plate something you need an electrolyte made from a solution of a copper salt, while for gold plating you need a gold-based electrolyte—and so on. Next, you have to ensure the electrode you want to plate is completely clean. Otherwise, when metal atoms from the electrolyte are deposited onto it, they won't form a good bond and they may simply rub off again. Generally, cleaning is done by dipping the electrode into a strong acid or alkaline solution or by (briefly) connecting the electroplating circuit in reverse. If the electrode is really clean, atoms from the plating metal bond to it effectively by joining very strongly onto the outside edges of its crystalline structure. Artwork: Copper-plating brass: You need a copper electrode (gray, left), a brass electrode (yellow, right), and some copper sulfate solution (blue). The brass electrode becomes negatively charged and attracts positively charged copper ions from the solution, which cling to it and form an outer coating of copper plate. Now we're ready for the main part of electroplating. We need two electrodes made from different conducting materials, an electrolyte, and an electricity supply. Generally, one of the electrodes is made from the metal we're trying to plate and the electrolyte is a solution of a salt of the same metal. So, for example, if we're copper plating some brass, we need a copper electrode, a brass electrode, and a solution of a copper-based compound such as copper sulfate solution. Metals such as gold and silver don't easily dissolve so have to be made into solutions using strong and dangerously unpleasant cyanide-based chemicals. The electrode that will be plated is generally made from a cheaper metal or a nonmetal coated with a conducting material such as graphite. Either way, it has to conduct electricity or no electric current will flow and no plating will occur. We dip the two electrodes into the solution and connect them up into a circuit so the copper becomes the positive electrode (or anode) and the brass becomes the negative electrode (or cathode). When we switch on the power, the copper sulfate solution splits into ions (atoms with too few or too many electrons). Copper ions (which are positively charged) are attracted to the negatively charged brass electrode and slowly deposit on it—producing a thin later of copper plate. Meanwhile, sulfate ions (which are negatively charged) arrive at the positively charged copper anode, releasing electrons that move through the battery toward the negative, brass electrode. It takes time for electroplated atoms to build up on the surface of the negative electrode. How long exactly depends on the strength of the electric current you use and the concentration of the electrolyte. Increasing either of these increases the speed at which ions and electrons move through the circuit and the speed of the plating process. As long as ions and electrons keep moving, current keeps flowing and the plating process continues. Photo: Plated plastic is often used on parts that need the shiny finish of a metal without its strength or heaviness, and here are three examples from my own home. Top: The switch, hands, and bezel (dial surround) of this alarm clock look shiny and metallic, but they're actually plastic. Middle: Plumbing parts that don't need to be strong are often made from plated plastic so they stay cool to the touch and blend in with metal pipes. The temperature control on this shower (right, with the red button) is made of plastic, but looks similar to the main metal components on the left. Bottom: This USB computer microphone has been given a shiny plated finish to make it look expensive and high-quality. Inexpensive, easy to form into different shapes, lightweight, and disposable, plastics rapidly became the world's most commonplace and flexible materials in the 20th century. But, to many people, that's as much of a drawback as a benefit: plastics are cheap and cheerful—and that's exactly what they look like. One solution is to coat a cheap plastic with a thin layer of metal to give it all the benefits of plastic with the attractive, shiny finish of metal. Many different plastics can be plated this way, including ABS, phenolic plastics, urea-formaldehyde, nylon, and polycarbonate. You'll often find parts on cars, plumbing, household, and electrical fittings that look metallic but are, in fact, plated plastic. They're lighter, cheaper, rustproof, and don't require any polishing after plating. "... my pal... told me he had a process for metal-plating plastics. I said that was impossible because there's no conductivity; you can't attach a wire. But he said he could metal-plate anything..."
If you know anything about plastic, you'll spot the obvious problem straightaway: plastics generally don't conduct electricity. In theory, that should completely rule out electroplating; in practice, it simply means we have to give our plastic an extra treatment to make it electrically conducting before we start. There are several different steps involved. First, the plastic has to be scrupulously cleaned to remove things like dust, dirt, grease, and surface marks. Next, it's etched with acid and treated with a catalyst (a chemical reaction accelerator) to make sure that a coating will stick to its surface. Then it's dipped in a bath of copper or nickel (copper is more common) to give it a very thin coating of electrically conducting metal (less than a micron, 1μm, or one thousandth of a millimeter thick). Once that's done, it can be electroplated just like a metal. Depending on how much wear and tear the plated part has to withstand, the coating can be anything from about 10–30 microns thick. 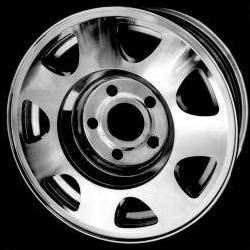 Photo: This car wheel is made from aluminum metal plated with nickel in a more environmentally friendly process developed by Metal Arts Company, Inc. The Microsmooth™ process uses about 30 percent less electricity, nearly 60 percent less natural gas, and half the water that conventional plating processes need. Photo by Metal Arts Company, Inc. courtesy of US Department of Energy (DOE). Electroplating is generally done for two quite different reasons. Metals such as gold and silver are plated for decoration: it's cheaper to have gold- or silver-plated jewelry than solid items made from these heavy, expensive, precious substances. Metals such as tin and zinc (which aren't especially attractive to look at) are plated to give them a protective outer later. For example, food containers are often tin plated to make them resistant to corrosion, while many everyday items made from iron are plated with zinc (in a process called galvanization) for the same reason. Some forms of electroplating are both protective and decorative. Car fenders and "trim," for example, were once widely made from tough steel plated with chromium to make them both attractively shiny and rust-resistant (inexpensive and naturally rustproof plastics are now more likely to be used on cars instead). Alloys such as brass and bronze can be plated too, by arranging for the electrolyte to contain salts of all the metals that need to be present in the alloy. Electroplating is also used for making duplicates of printing plates in a process called electrotyping and for electroforming (an alternative to casting objects from molten metals). Electroplating: how it works: From finishing.com, includes a few examples of safe and simple electroplating experiments you can try yourself. Instructables: Simple, cheap electroplating: Another DIY electroplating experiment using simple, household items. Electroplating—how it's done: A clear introduction to the theory and practice of electroplating and the huge range of everyday things it's used for. Also covers how plastics can be electroplated and why electroplating often needs to be applied in a number of separate layers or "coats." Electroplating a quarter: Clearly and simply explained in this brief little video from chemistry teacher Mr Kent. Electroplating: Engineering Handbook by Lawrence J. Durney (ed). Springer, 2014. Another detailed reference, mainly intended for people working in the metal finishing industry. Electroplating: Basic Principles, Processes and Practice by Nasser Kanani. Elsevier, 2004. A detailed introduction for chemistry students, as well as manufacturers. Modern Electroplating by Mordechay Schlesinger, Milan Paunovic (eds). Wiley, 2011. A huge and comprehensive guide, with chapters on electroplating all the common metals, including copper, nickel, gold, and tin; plus coverage of electrodeposition, semiconductors, organic films, and many more topics. Surely You're Joking, Mr Feynman! by Richard P. Feynman. Vintage, 1992. The chapter titled "Chief Research Chemist of the MetaPlast Corporation" (p.41 of my edition) is a short but amusing anecdote about electroplating plastics—of which Feynman, it turns out, was an accidental pioneer. These are best for ages 9–12, but the experiments could be adapted for older or younger children. Chemistry for Every Kid: 101 Easy Experiments that Really Work by Janice VanCleave. Jossey-Bass, 2010. A very good activity-based introduction to chemistry (with a little bit of physics and biology thrown into the mix as necessary). Originally published in 1989, but just as relevant today. Activity 43 (Green Pennies) is an example of metal plating. Step-by-Step Science Experiments in Chemistry by Janice VanCleave. Rosen, 2013. A newer and shorter selection from the same author. It's Elementary by Robert Winston. DK, 2007/2016. A general children's introduction to chemistry, focused on the elements, for ages 8–10. US Patent 6,527,920: Copper electroplating apparatus by Steven T. Mayer et al, Novellus Systems, Inc. March 4, 2003. A detailed description of the kind of electroplating processes used in making integrated circuits. US Patent 4,039,714: Copper electroplating process by Yutaka Okinaka, AT&T Bell Laboratories. September 4, 1984. Describes a typical modern bath for copper plating.